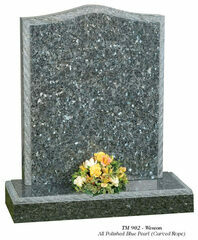 Mossfords Memorials Monumental Masons offer a full range of the finest quality memorials. Mossfords is a family run business assuring a caring and dignified service. Most of us at some time in our lives are faced with the painful task of choosing a suitable Memorial for a departed loved one. We at Mossfords Memorials understand that this can be an extremely stressful and emotional time for all concerned and the Memorial you choose will forever honour the life of someone you love. It is far mor than a stone to mark a grave, it marks the history of events and embodies the personality, character, accomplishments and beliefs of a person. If you wish to contact us please call 01978 262519. Thank you for your interest in Mossfords Memorials.